Immediately following the original Snowden revelations in June 2013, I wrote a research paper inquiring into the nature of the U.S. national surveillance state with respect to the natural law treatment of human civil liberties. That paper comprises Part 1 of this research blog. At that time the research findings strongly suggested the U.S. national surveillance state was deep into authoritarian territory by using a framework provided by Yale Law School’s Jack Balkin in his work, “The Constitution in The National Surveillance State”. 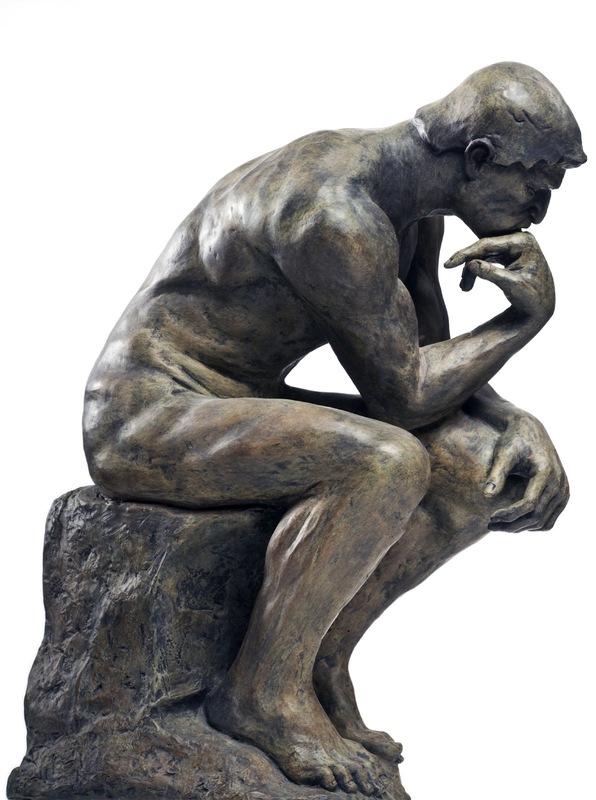 Famed Nobel Prize winning economist and political commentator, Paul Krugman, in his response to the Snowden revelations, also used Balkin’s framework and came to the same conclusion but has said very little about this topic since. Although, this week Krugman did say that surveillance isn’t that big of a deal. What is the Foreign Intelligence Act(FISA) & National Security Letters(NSL)? What are the three main threats national surveillance poses to our freedoms? Since the National Surveillance State is a form of the Information State, let’s now look at the definitions Jack Balkin provides for Democratic vs. Authoritarian Information states. Then I will reexamine the status of the US. National Surveillance State to determine to what degree it can or cannot be considered authoritarian. Lets now examine the status of the U.S. National Surveillance state through the lens of Jack Balkin’s framework with the benefit of having many more articles and hundreds of source documents from the Snowden archive to examine. Moreover, we also have court decisions and policy positions to color the discussion. What is the status of the U.S. National Surveillance State? The concept of a Democratic National Surveillance State brings to mind a number of oxymoronic statements. (45) For example: A cuddly porcupine, clear as mud, definitely maybe, etc. Perhaps we would all be better off just dismantling the surveillance state entirely and throw it in the waste bin. (46) In addition, we would also be required to remove all the laws associated with the surveillance state. (47) It is pleasant to dream of those visions of the future, however the reality is that will never be more than a dream, thus we find national security states operating on a spectrum somewhere in between Democratic and Authoritarian. On June 6th, 2013 top-secret NSA documents depicting an expansive and powerful surveillance program that included the help and legally required collaboration of U.S. telecommunications and technology companies were publicly leaked. (47) The program exposed, “Prism”, while by itself may not be very surprising to many people because it seems to be a common belief that government should have reasonable ability to look into records for security purposes when it has probable cause. (48) In essence, an operational program like “Prism” in of itself is about as expansive as one can get. 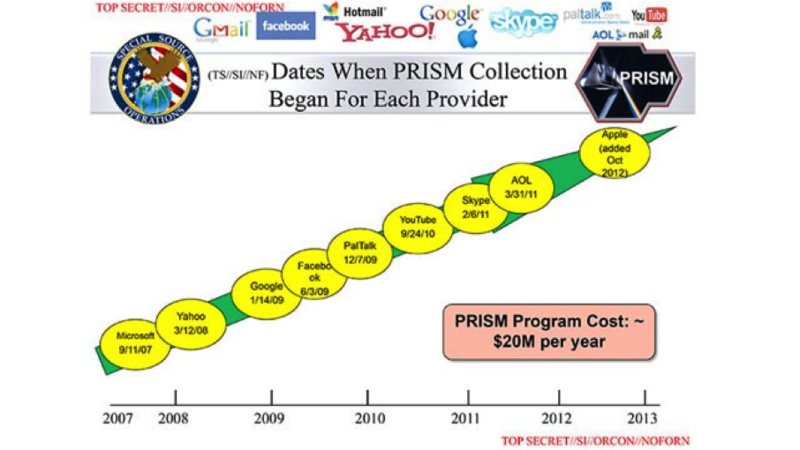 The “Prism” program, according to the leaked document seen above, included name brand technology companies such as Microsoft, Yahoo, Google, Facebook, PalTalk, Youtube, Skype, AOL, and Apple. The U.S. Department of Justice utilized current legal instruments in the form of FISA Warrants and National Security letters to compel and extract this information. Without going into too much detail essentially these instruments enabled the government to secretly request information of which the receiver of the request could not publicly disclose nor could they deny. (49) It was also done through a court system set up by the government that nobody but the government could present a case, and this is still true today. (50) The U.S. Government also used these same legal instruments and systems to request comprehensive and ongoing meta-data phone records on all Verizon customers. (51) The metadata bulk collection programs are approved under Section 215 of the U.S Patriot act, which is set to expire on June 1, 2015 unless it is re-approved by Congress. Given the lack of public discourse or debate about the renewal of this section of the Patriot act, it will likely be re-approved to very little fanfare. Supporters of metadata bulk collection often tout that it is not the content of calls. While that may be true for that specific program, the NSA does have other programs that can accomplish that goal. One program specifically called “Mystic” is an NSA program capable of recording 100 percent of a foreign country’s telephone calls, enabling the agency to rewind and review conversations as long as a month after they take place. (54) The Mystic program is effectively a Time Machine program for voice conversations. Another program exposed by the Snowden archive is XKeyscore. (55) This program gives the widest reaching collection of online data to the NSA. (56) NSA analysts require no prior authorization to engage in searches and this program sweeps up emails, social media activity, and browsing history. (57) The stated mission of the NSA in its own documents is to “Collect it all”. As more of these surveillance and data collection programs became public a natural question became how were these programs legally justified. The New York Times published an article from the Snowden archive explaining how the secret FISA court evolved overtime from an adjudicator of the surveillance practices to an interpreter of the underlying laws that support them. (66) Thus creating a duel set of laws under our Constitution where one set of interpretations is public while the others are top secret for national security purposes. (67) The NYT article gives significant weight to my researching findings in Part 1 that the only method for interpreting the Constitutions 4th amendment, that would reasonably allow for these types of data collection/surveillance programs to be approved, is the “Dynamic Incorporation” method. This is the only method of interpretation that allows for the tension between the notions of “search” and “seizure” to be fully released, thus giving courts and government attorneys the ability to justify whatever they want. Jill Abramson was the most recent Executive Editor of the New York Times and in January 2014 said the Obama administration is the most secretive administration she has ever covered in her long career in journalism. (73) The effect of this dampening effect would be that whatever the government is saying publicly by proxy becomes truth because there is no check on the validity of the information due to fear of retribution to participating government insiders. Exercising the use of a secret subset rule of law under the guise of National Security to fight terrorism, while also saying the war on terror is subsiding. Investigating the Associated Press to suppress leaks through new and broad interpretations of the law. Collecting data of all types against all foreign people and U.S. domestic citizens. There is a probable fifth notable action the current U.S administration is taking. That action is using government agencies to suppress and intimidate political enemies, such as the IRS targeting conservative groups for audits and tax-exempt status, while scrutinizing liberal leaning groups much less if at all for the same issues. While the investigation into this Fifth action is still ongoing, in the context of the other validated and corroborated dubious actions it is hard to imagine that senior White House staff, or even the President himself, if not directly order these actions, simply did nothing to stop them, most likely by “accident”. The irony being that nothing happens by accident in politics. Administrative law is commonly defended as a new sort of power, a product of the 19th and the 20th centuries that developed to deal with the problems of modern society in all its complexity. (99) From this perspective, the Framers of the Constitution could not have anticipated it and the Constitution could not have barred it. (100) What Hamburger suggests, in contrast, is that administrative power is actually very old. (101) It revives what used to be called prerogative or absolute power, and it is thus something that the Constitution centrally prohibited. (102) So is the U.S. still an authoritarian National Surveillance state with respect to the natural law treatment of human civil liberties? While each one of the actions by the U.S. government discussed above on an individual basis would probably not constitute a strong argument the U.S. Government is far into Authoritarian Surveillance State territory. But all of the corroborated actions together create an overly compelling case for that argument to still ring true today. In fact, it seems Totalitarianism in the U.S. is seeking to cement itself firmly in place and our government officials from all three branches seem perfectly Ok with that. Noam Chomsky would probably say this is the perfect storm for the current U.S. administration and future administrations to meaningfully “manufacture the consent” of domestic and foreign people. (103) Authoritarian regimes and their proxies utilize propaganda to support their policies and interests. The U.S. is no different. On April 13th, 2015 the prestigious Council on Foreign Relations published an article titled: “The Good News About Spying”. This CFR article would lend one to believe the Obama administration is the most ardent defender and protector of civil liberties, that is of course if someone were gullible enough to believe it. All authoritarian regimes utilize information to try and stifle those people and organizations that seek to speak truth to power. In the U.S. we have the First Amendment, which guarantees freedom of speech and freedom of the press. With the U.S. already being an authoritarian national surveillance state that has two sets of laws, a law enforcement and administrative state that supports the parallel track of laws, and utilizes private/public cooperation to engage in these activities; how would the U.S. government look to use administrative law to place limitations on speech through the utilization of information technology? That is the topic of my next research post. This entry was posted in Thoughts and tagged Civil Liberties, FBI, Jack Balkin, National Surveillance State, NSA, Philp Hamburger. Bookmark the permalink.